The joint conference of the Society of Occupational Medicine and the Royal College of Nursing took place in Brighton on 18-19 October 2010. The theme was: “The Common Goal – getting the best results in occupational health practice”. Noel O’Reilly reports. Occupational health provision should not be reduced in response to the Government’s Spending Review in October, Peter Carter, chief executive and general secretary of the Royal College of Nursing (RCN) told delegates. Carter said it was an urban myth that the NHS would be protected from the public-sector cuts announced in the review, and that between £15 billion and £20 billion (20%-25%) would need to be cut from the NHS budget. He called for leadership from nurses and doctors to deliver the changes to the NHS outlined in the Government’s White Paper Equity and excellence: Liberating the NHS, published in June 2010. “We [the RCN] believe that in some [NHS] organisations there is a lack of leadership, a lack of understanding about what needs to be done to address this. What’s going on is a fool’s paradise,” said Carter. He said: “OH services in the NHS could learn from private-sector exemplars,” and should build on the recommendations of the Boorman review of 2009. “Steve Boorman’s work should be part of the objectives of every trust and people should be performance-managed on the Boorman report the same way they are on financial performance,” added Carter. Carter said the Government’s White Paper, which sets out its long-term vision for the future of the NHS, should have considered more the role that nurses and the nursing profession could play in leadership. “One of the main concerns with the White Paper is an almost complete absence of clinical and nursing leadership. With the absence of nursing leadership we’re going to see some of the problems we’ve had in recent years,” he said. Dr Tony Stevens, medical director of Belfast Health and Social Care Trust, also spoke about leadership. He said that leadership in the NHS needed to move from traditional autocratic styles to collaborative approaches. “Rather than having iconic figures of leaders we need to see ourselves as teams or communities for leadership,” he said. He encouraged delegates to read the Medical Leadership Competency Framework developed by the NHS Institute for Innovation and Improvement and Academy of Medical Royal Colleges. Stevens added that personal integrity is important. “We need that for effective and strategic influencing,” he said. Occupational health doctors and nurses need to speak with one voice and broaden the sector’s remit to gain a leadership role in the Government’s economic reforms, said Dame Carol Black, national director for work and health. She said: “OH professionals have a unique expertise and perspective to understand the links between health and productivity and that will be a great help for our Government at this moment in time. A new body set up to coordinate activity between workplace health practitioners is tackling the crisis in occupational health nurse education and training. 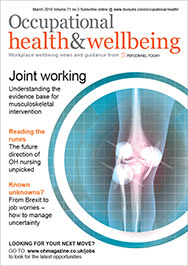 The Council for Work and Health, which was formed in 2009 in response to Black’s review of health and work, has produced a paper written by senior OH nurses to initiate talks with chief nursing officers and the Nursing and Midwifery Council (NMC). The paper, written by OH nurse educator Anne Harriss, argues that there are serious shortcomings in arrangements for the training and qualifications of OH nurses. A meeting will take place between the council and the NMC, Diana Kloss, a barrister and the council’s chair, told delegates. The council is also producing guidance in consultation with the Royal College of General Practitioners for employers on communicating with GPs and drafting a letter that an employer can give to an employee to get advice on functional capacity for returning to work. The council’s website gives employers information about the different professions involved in workplace health and what they do. Kloss asked practitioners to tell the council what programmes it should develop. “We also want your support in raising the profile of OH with employers and the general public,” she said. A small-scale fit note survey in Bradford on Avon by GP Dr James Heffer showed the note was useful but limited and that employers were more resistant to it than patients and GPs. When asked to score the helpfulness of the fit note on a scale of zero to 10, where 10 is the most helpful, the average score of employers was 3.6, compared with 6.1 among doctors and eight among patients. However, the survey showed that there were indications that the speed of return to work after illness had been enhanced by the process, said Heffer. He said GPs, OH and practice nurses needed to support employers. “It is for us to provide managers with the practical steps needed to interpret the note and turn it into a programme of work for a specific employee. OH practitioners can assist in converting return-to-work opinion into management outcomes,” said Heffer. Heffer said only enlightened employers had the skill to interpret the advice on fit notes. The survey found that the fit note was of little use in helping unemployed people back into work. ensure that advice and information has practical value to HR, management and employers. Understand the business case for adjustments. There is limited evidence that health surveillance programmes work in practice, according to Dr Steven Sadhra, senior lecturer and director of education for occupational medicine at the Institute of Occupational and Environmental Medicine at the University of Birmingham. Sadhra advised OH practitioners to quantify the essential benefit of surveillance programmes and make changes. He said they should be engaged in the whole process from setting up controls, monitoring and acting on findings. A show of hands showed that no delegates were engaged in all stages. He concluded that health surveillance is effective when there is a clear purpose for it, an appropriate management system, workforce engagement, defined responsibility, actions taken and an audit of the programme’s effectiveness.